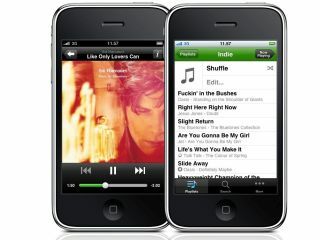 Spotify on mobile - Napster To Go all over again? When the iPhone version of Spotify hit the App Store last week, we were amazed by the reaction. Instead of endless posts singing the praises of mobile music, the reviews were largely negative: at the time of writing, 5,985 reviews of 9,164 are one-star reviews. The problem? Spotify expects people to pay for music. Were the comments by people who believe that everything should be free, irrespective of what it costs to produce? Perhaps - but maybe some of the negative reviewers have a point. £9.99 per month for music sounds reasonable, but only when you don't compare it to anything else. The average person buys six CDs a year, we're told, and at current prices that isn't even £50 per annum - and that's for music that can be ripped, transferred to other devices and played in anything that's got a CD slot. Spotify doesn't limit you to six CDs a year, of course, but the songs are tied to the software - and there's only so much time anybody can spend listening to music. Don't believe us? Three words: Napster To Go. Like Spotify it offered unlimited music for a fixed monthly fee, and while it wasn't available on mobile - Napster Mobile was a shopfront, not a music service - it did work with PlaysForSure MP3 players. Essentially, then, it offered the same deal as Spotify. It stiffed. Napster was flogged to Best Buy at the end of 2008 with just over 700,000 paying subscribers. For a service that's available not just in Europe but across the entire US, those numbers are terrible. And then there's the BBC. If you look at the Beeb's breakdown of where the licence fee goes, £2.01 per month gives you all the BBC's radio output - that's Radio 1, Radio 2, 40-odd regional stations, the specialist DAB-only channels, the Asian Network and the talk and sport channels - while a further £0.61 per month gives you online, which means podcasts, streaming and iPlayer. £2.62 for the Beeb compared to £9.99 for Spotify? Suddenly Spotify doesn't look quite so attractive. Part of the problem is that in order to exist, Spotify has to pay the bills - and you can be confident that it's paying rates that the BBC would laugh at. By all accounts the going royalty rate for streaming music is around 1p per stream, which doesn't sound like a lot until you start getting lots of users. One user listening to ten streams per day is 10p a day, or £3.00 per month - which means Spotify's paying more than the BBC spends on its entire radio and online output. Spotify may have a special deal - its investors include record companies - but it's unlikely to be so special that it'd turn the BBC green. In exchange for access to all of the recorded music in the world, the BBC pays £50 million a year. You can be sure that Spotify - or any other streaming music service - doesn't get anywhere close to that kind of price. Perhaps we're wrong and Spotify's mobile application is going to be an enormous success. But we're beginning to think that Apple's approval of the application suggests otherwise. Apple could have killed Spotify by refusing to approve it, or by bringing out a subscription-based iTunes. It stuck an FM tuner into the iPod Nano instead. Anybody reckon Apple's made the wrong choice?